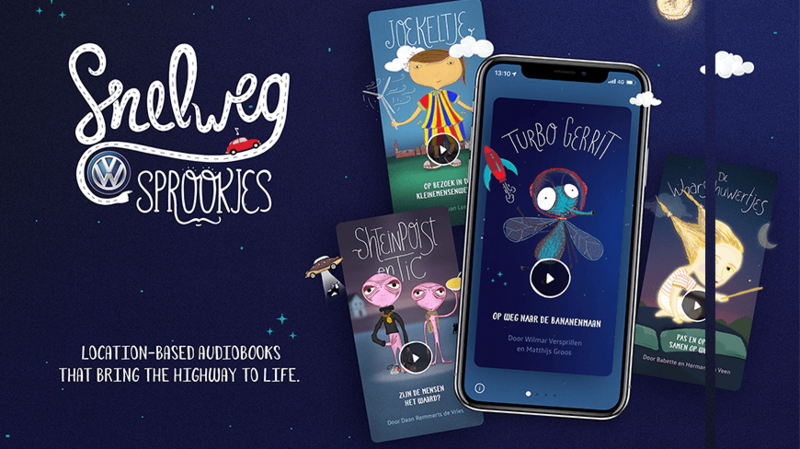 In January, Volkswagen launched ‘Snelweg Sprookjes’ (translated: Road Tales) an app with location-based interactive audiobooks that transform ordinary road objects into magical characters of a story. The app is free to download on iTunes and Android in the Dutch market and reached number one in the books category of the Apple app store within 24hours of launch. The ACHTUNG!! mcgarrybowen team was briefed by Volkswagen to promote the auto brand with an idea that could make car journeys more enjoyable. The insight was that children are increasingly looking to screens for entertainment in car journeys, and after collaborating with Kraftwerk Linked by Isobar, the cross Dentsu Aegis Network team created a solution to encourage children to stay curious and look outside for inspiration. ‘Road Tales’ was developed for Dutch children between 4-11 years old and works across all mobile devices. It uses a custom developed story-engine that creates unique tales based on the location of the user. To ensure the stories to react to the environment, the team scanned all Dutch highways to identify objects like bridges, windmills, trees, petrol stations, and other main objects to transform them into story elements. The app uses geo-location the app to pinpoint where you are. The team loaded in all the surveyed objects, so the app can identify these objects to build a tailor-made story for each user, ensuring a seamless online to offline experience. As a digital product and campaign, Rode Tales was lead by both Daniel Sytsma Isobar Chief Design Officer, and Mervyn ten Dam, ECD ACHTUNG! Mgcarrybowen. 1) Research all open data sets to provide a set of standard objects, like windmills, tunnels, and forests along the road routes. 3) The team drove popular highways by car to manually check and add new location points using a custom built data entry system. The team wanted the app to work on every part of the Dutch highway system, totaling over 5000 Kilometres. To do this the team had to come up with a modular story structure that enables people to start a story at any point and rearranges chapters in real-time, depending on the objects en route. Figuring out this story engine and all its edge cases required an intense collaboration to the team of writers and the team of technologists. The experience is at odds with the typical sales approach for an auto brand. In a competitive market, most car marketers focus their attention on direct sales to deliver a more predictable return on investments. Volkswagen made the strategic decision to drive brand empathy. Isobar Chief Design Officer Daniel Sytsma said, "When we had to convince our client we knew that a traditional presentation at their office wouldn't work. This is the type of work you need to experience to believe it. So we decided to take the presentation to the backseat of a small Volkswagen where we showcased a working prototype of a demo story that was created specifically for the highway next Volkswagens office. It allowed Volkswagen's marketing manager to understand the experience from the childs perspective." In collaboration with some of the top children book writers, the combined team created a story for every road by writing dynamic story chapters that are triggered by objects along the journey. Each road is different, so as a result, every story is different. Each story follows a structure that many kids books use. We get introduced to a character that is looking for something or someone. The character goes on a journey and finds multiple things or other characters on it’s way. These experiences add up to the resolution of the quest. This structure is perfect for a location-based modular story. In close cooperation with some of the best child book writers in the Netherlands the team wrote four unique stories, for example, (1) Turbo Gerrit, a fruit fly in your car wanting to go to the moon, The kid giant (2) Joekeltje shoing children the highway from a giants perspective, a Crazy alien duo (3) Shteinpoist and Tic investigate mankind on the road, and (4) The Guardians about a little guardian angel who hitchhikes along towards her guardian angel exam. The combined team briefed the writers on what was technically possible. The writers were in the lead of the creative aspects, and together with our creative team, that each story was technically approved to implement in the app. As a result of the success of the app, children’s authors have approached Volkswagen for their stories to be featured. To promote the app at sales points and in dealerships, the team collaborated with a Dutch foundation called ‘The National Reading Days’. This foundation is making campaigns to educate people on the importance of reading. Together with the foundation, Volkswagen host reading sessions at Volkswagen dealers, where they invite kids and parents to read stories together. One of the writers of Snelweg Sprookjes read stories for the group of kids whilst parents (and kids) were invited for a ‘test drive’ using the app. Watch the case video here.